Orthodoxy has a number of “favorite” words – all of which fall outside the bounds of normal speech. Though we commonly use the word “mystery” (for example), popular speech never uses it in the manner of the Church. I cannot remember using the word “fullness,” or even “fulfilled,” in normal speech. More contemporary words have come to replace these expressions. This doesn’t mean that an English speaker has no idea of what the words mean – but, again, they do not understand these words in the manner of the Church. There is a reality to which words such as mystery and fullness refer – a reality that carries the very heart of the Orthodox understanding of the world and its relation to God. In popular usage, the word mystery has become synonymous with puzzle. Thus a mystery is something we do not know, but something that, with careful investigation is likely to be revealed. In the Church, mystery is something which by its very nature is unknown, and can only be known in a manner unlike anything else. Words such as fullness and fulfilled are equally important and specialized in the language of the Church, but whose meanings bear little resemblance to popular speech. Fullness (pleroma), occurs a number of times in the New Testament. It was also a favorite word in the writings of the gnostics. In Christian usage, it refers to a spiritual wholeness or completeness that is being manifested or revealed in some way. It is more than a Divine act – it carries with it something of the Divine itself (God Himself is the Fullness). It is not simply the action of God, but is itself God. Prior actions and words may have hinted at the fullness, but in the revelation of the fullness all hints will have passed away and been replaced by the fullness itself. The core understanding of words such as mystery and fullness is the belief that our world has a relationship beyond itself, or beyond what seems obvious. The world is symbol, icon and sacrament. Mystery and fullness reference the reality that is carried as symbol, icon and sacrament. And He [the Father] put all things under His [Christ’s] feet, and gave Him to be head over all things to the church, which is His body, the fullness of Him who fills all in all (1:22-23). For in Him dwells all the fullness of the Godhead bodily; and you are complete in Him, who is the head of all principality and power (2:9-10). The English disguises the wordplay within the verse. We are told that “in Christ dwells all the fullness (pleroma) of the Godhead (or deity) bodily, and you are the ones who have been made full (pepleromenoi) in Him…” Again, this time Christ is described as the fullness, but we have also been made the fullness (pleroma) in Him. His life is our life, and this life or fullness is precisely that which is important about us. I do not pray for these alone, but also for those who will believe in Me through their word; that they all may be one, as You, Father, are in Me, and I in You; that they also may be one in Us, that the world may believe that You sent Me. And the glory which You gave Me I have given them, that they may be one just as We are one: I in them, and You in Me; that they may be made perfect in one, and that the world may know that You have sent Me, and have loved them as You have loved Me (17:20-23). In John, Christ has given us “his glory,” just as the Father gave Him glory. Glory is not praise or reputation, but rather something substantial (as I search for words). In Hebrew, glory (Kavod) is precisely something substantial, the weight of something. God’s kavod pushes the priests to the ground at the consecration of Solomon’s temple (1 Kings 8:11). But glory is not simply an effect of God, it is, somehow, God’s presence itself. Fullness has a relation to glory, in this substantial sense. … we beheld His glory, the glory as of the only begotten of the Father, full [pleres] of grace and truth…. And of His fullness [pleroma] we have all received, and grace for grace (Jn. 1:14 and 16). The glory of the only begotten is full of grace and truth and it is of this fullness that we have all received. I am sure that this excursion through Scripture may be somewhat tedious for readers – but it is an excursion through unknown territory for many. Mystery, fullness, glory and the like are largely neglected in many of the doctrinal structures of the West. Where they are not neglected they are stripped of mystical content and morphed into more rational systems. 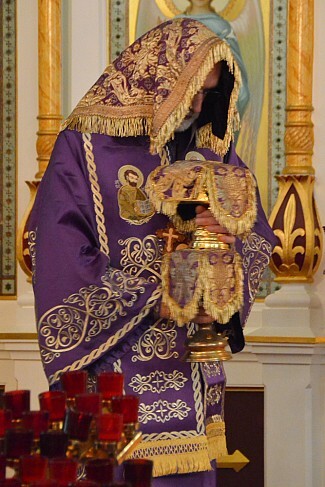 Within the Orthodox East, the mystical content is allowed to shine forth – particularly within the liturgical life and prayers of the Church (this is also true of the ascetical tradition of the Church). One place where language and reality are deeply united is in the Liturgy of the Pre-Sanctified Gifts (celebrated on the weekdays of Great Lent and Holy Week). The Eucharist is not celebrated on these days, but communion is given from the gifts consecrated on the Sunday previous – thus the Liturgy of the “Pre-Sanctified” Gifts. Just before the entrance, the choir sings, “Now the powers of heaven do serve invisibly with us. Lo, the King of glory enters. Lo, the mystical sacrifice is upborne, fulfilled.” The Gifts of Christ’s Body and Blood are indeed the “mystical sacrifice,” the very mystery hidden from the ages made manifest and present in the midst of the Church. This same mystery is also the fullness – its presence is fulfilled. The Christian life lived within the mystery is a life in which God is hidden, made known, revealed, perceived. It is a life in which the Kingdom of God is breaking forth, not destroying nature but fulfilling it. In the same manner, we are not destroyed by our union with Christ but rather fulfilled. We become what we were created to be – the fullness of that life and more is made manifest within our own lives. It is this same fullness that describes the lives of saints. Saints are more than moral exemplars to be copied – they have the quality of life-fulfilled. In them, the fullness that is ours in Christ is made manifest. The mystical life marks the whole of Orthodox Christianity. Its doctrines are replete with references to the mystery and speak of matters such as the atonement in a manner that is consistent with the revelation of this mystery. The Conciliar definitions, from first to last, are rooted in this language and presuppose its grammar within every aspect of the life of the Church. One of the remarkable little things that speaks to both the mystery and the fullness of the Church: St. Athanasius at the beginning of his inexhaustible treatise On the Incarnation says that he is merely transmitting the wisdom of the Church that had been ‘traditioned’ to him. Tradition is another word vastly misunderstood. Father – thank you. I often wonder if nonbelievers perhaps properly understand mystery the most when they suggest things such as “well I don’t know how, but he’s God, he should be able to do that” and/or “he should be able to have created us in a way that we understand Him clearly and easily but are also not controlled to do so, because he’s God and he should be able to do that.” It’s amusing because that’s exactly what he has done. Beautiful, mystical, theological language. We are so poor when we don’t have it, and so rich when we have it and begin to understand it. Thank you. Christine, yes! “Later, I began to see that mystery is not so much inexplicable as inexhaustible. ” I have come to the same place. I also think mercy in the Church and its Liturgy and prayers is another word that goes beyond what we realize as moderns. It has come to mean grace and humility and love and a way . . . And, words fail me. . . I don’t think one can be Orthodox unless one sings, physically or just through interior harmony, in company with one’s congregation – nor can any singer of this hymn be other than fulfilled and fulfilling. if we couldn’t enter into the mysteries of God, God would not have endowed us with his Spirit. He would have given it to us in the next life, since we would have no use for it in this one. But that he gave it to us now means that these mysteries are accessible to us in this life. Interestingly enough, the Protestant singer Rich Mullins once said that he didn’t particularly like his voice but he sang because God had commanded it. That has always stuck with me. That quote is wonderful and it is how I want to live my life. The trouble is, I don’t know how to do that. Being relatively new to Orthodoxy, perhaps I have yet to understand what was quoted. I really do want to attain such a way of living. When to create and maintain the heat of a (spiritual) fire, we do two things: we keep adding fire-wood and we minimize the dissipation of the heat. Thank you for commenting. Does that mean we keep praying a lot, taking Holy Communion, & repenting (these being the firewood)? Thus, these things keep the heat from dissipating? I know exactly what you mean, about wanting to live our life that way. I don’t think any of it has to do with how long we are Orthodox, I have been Orthodox all my life, but that means nothing…. One thing I discovered is that every day, we make a new beginning on this spiritual path. We cannot look back to assess the failures of our past (we confess them and forget them). 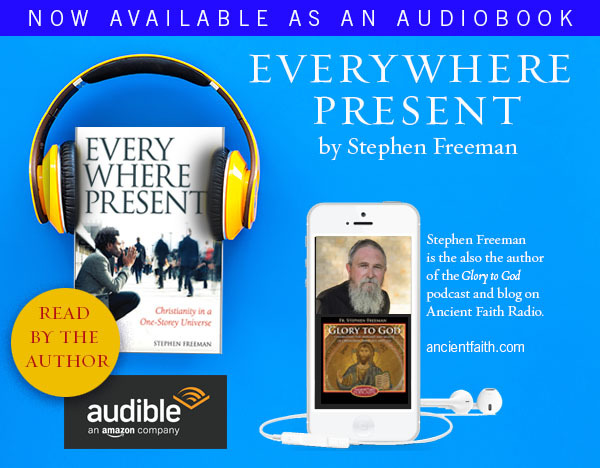 Even great Saints of early Christianity assessed their spiritual progress by the intensity of their presentation before God “here and now”, disregarding their past accomplishments (that’s according to Fr. Zacharias of Essex). As Dino says, we protect our gains (minimize the dissipation of heat) and add to the fire (keep adding whatever we can: prayer, fasting, almsgiving, participation in Mysteries, withdrawal from pleasures and fascination in the things of the world, etc, etc). “The great majority of people leave the vineyard of their soul wide open. Just about all of us are found in that category. We allow our unruly mob of thoughts to enter and crowd our minds, making our heads a kind of bombardment site. And we allow our mind to be filled continually with strange things because we do not have the Spirit of God, and because we have never really been interested in God anyway. When someone’s head is filled with thoughts it means he is not filled with God. If he had God, then where is the power and the love of God to remove all the thoughts that torment his mind on a daily and indeed hourly basis? To be filled with thoughts reveals a lack of repentance, which means there has been no change of mind. It signals an absence of spiritual life, an absence of basic, elemental experience of God, and thus the absence of God”. At first glance it seems very strict, but I think it is very honest and true. As I read once in some secular self-help book (they often get some of these things right, even if by accident 🙂 ), “we are the only ones who think inside our heads”. Our “free will” was given to us exactly for that purpose, to choose what we think. May God help us fill our heads with thoughts of Him in this Lenten period. Small things have great power when they reach the stage of having the support of ‘habit’. Fire-wood are indeed those things, for some, studying/reading produces more zeal, for others the continuous remembrance of fasting… Of course, we cannot let go of communion and prayer (the sacramental and the mystical arm of spiritual life) and expect the Divine fire of the Spirit to kindle our spirits. The guarding from dissipation is, in one word, called vigilance (‘Nepsis’) in thought, emotion, the five senses etc. It is better viewed as a positive focus on God alone, rather than a negative renunciation of everything that is not Him. The two combined speak produce a queer combo (one we find in all saints) of joy and solemnness. There’s much more in cultivating such living faith though! *correction: “The two [fortifying both our inspiration & our vigilance] combined, produce a queer combo (one we see in all saints) : of joy and solemnness. Thank you again! That makes things much clearer than before and I’m starting to understand. The quote from Elder Aimilianos does seem strict but how true it is for me with all the thoughts swirling around in my head. You are so kind for taking your time to give such helpful comments. Dino: Thank you too – especially expanding on some things such as making the small things a habit and including studying/reading which could be counted as firewood. I read/study a lot to try to grasp the deeper things in Orthodoxy and this helps me stay “fired-up”. Vigilance/Nepsis is something that I have yet to grasp very much and this is where I think that I leave the “vineyard of my soul wide open”. I really appreciate your comments. They have opened my “spiritual eyes”. Anna…I’ve got to chime in here. Have you ever heard your Priest speak harshly as does the Elder in the verse quoted above (and it is harsh, and is meant to be)? I would venture to say you have not. There is a reason for that. Many of the books we read are written for monastics. We are not monastics. Unless you have a spiritual guide to counsel you (most of us do not have a spiritual guide as described in these books) in these “hard sayings” there will be a time after many failings that you will become very discouraged because you will have taken those words, on your own, to heart. You are new in the faith? Take heed. Our walk in the faith is hard enough. Do a little at a time….pray a little, give (charity) a little, read scripture daily if you can, attend to the Liturgy as much as you can. No one is keeping a ‘check list’. Do what you can. Your heart is already toward God. Remember…you are not a monastic. Our lifestyle is completely different. Get pastoral counsel from your Priest. That is what he is there for. Align yourself with people you feel at peace with (you’ll sense this intuitively). I am not saying not to read material geared toward monastics. Nor am I saying to avoid visits to a monastery, and meeting with them. There is a lot to glean from them. But there is danger in thinking that the life that is described in monasticism should be our goal. We mistakenly think our life in the world is “less than” that of monasticism, and it is not. Actually, it is the life God gave us. You are already His light in the world, Anna. That in itself is going to be enough of a struggle. You have the people who are close to you in vicinity as your support. What you see around you, God has given for you to cultivate. Learn from those around you that have gone before you. You will be OK. Careful not to compare yourself with others. Thank you for your wise words. Taken with all the other comments, this helps me greatly. Your comments put everything said into perspective as it relates to how laity are to live. All the comments have helped me to paint a comprehensive picture of life lived as an Orthodox person. You are very correct in saying that the life that God gave us is enough of a struggle since mine is definitely overwhelmed right now with a very sick husband. Thank you again for taking the time to give such detailed comments. Please forgive me, but I need to gently disagree with some of what you wrote. Particularly the part where you say the quotes I provided are for monastics (maybe you mean the writings for monastics in general, although the holy Fathers say all such writings are for all of us, we just need to know how to apply them to our life). What I sense in these words from the Elder (in these quotes especially) is that we are ALL called to love God, to be interested in God and to make Him the main focus and interest of our life (isn’t this what Father Stephen describes in his book, how to be “a Christian of one-storey universe”?) and that the way to do it is (among others means) to guard our thoughts and cultivate our joy, inspiration and vigilance, as Dino said. In this calling, we are no different from monastics. It’s a beautiful calling for all humans to be people of eternity. Anna, may God bless you husband with the healing he needs and hold you both close! May God be with you and your husband. I too pray God carry you and your husband in blessedness during this difficult time. I understand the burden you speak of. I don’t quite think of making an issue of the supposed “disparities” in spiritual counsel directed towards monastics vs counsel directed at lay-people. We have but one Gospel for all. The ‘hardest sayings’ of all, in fact, come from the lips of our Lord Jesus Christ, who demands absolute devotion (Luke 14:26) of all His followers. This is then assuredly what our heart also truly yearns for. The diverse struggles against (all-inclusive) distraction affect lay-people as well as those living in deserts, and the various battles against spiritual discouragement (springing from our underlying bloated self-regard) are for monastics to contend with as well as lay-people. The life of perfection (no matter what the context) –nothing less– is what Christ has called a Christian towards. This does not mean we must become anxious or psychotic in any context. Whether such perfection becomes manifest in one’s patience during illness, another’s martyrdom, another’s unswerving joy, another’s monastic reclusion, or combinations of these and countless other situations makes little difference in the end. There is indeed a difference between the counsel given to monastics vs the counsel give to laity, in its approach, in the words that are used, and in practical application. Yes, it is all the same Gospel. And yes, we suffer the same temptations. But there is need for a different approach in counsel to lay people. Our parish Priest knows exactly the woes of living in a secular society, in America no less. If one is struggling in meeting the demands of life and at the very same time living within the Body of Christ, there has to be tender but firm and careful guidance. We are already beaten down in our own self-destructive thoughts (or bloated self-regard, your words) as well as from others. When someone is burdened and feeling overwhelmed, how helpful is it to read that if they are struggling that this is evidence that they do not know God? After suffering at length without any reprieve what is to stop them from concluding “well, I must have abandoned God”, “it is all my fault”, “this is like beating a dead horse”, “I can’t do this”. On you own, in this world of isolation, when this kind of despair hits, you do not have the strength to even look up, never mind seek the help of others. This is what I am talking about. Counsel to the laity is different. I admit, the way I worded my comment above could easily be taken as divisive. But there is some truth to this divisiveness between monastics and the Church. There has been contention in the past. Just as there is contention between jurisdictions. These can, will, have been, and are being worked out. Plus some of the laity lean more toward monastic influence than others. This should not be a problem, of coarse. But being new in the faith and reading about the Desert Fathers (oh! that was the very first book I read! Not Met. Ware’s but the Desert Fathers!) and believing that their lifestyle, strange as it may seem, should be emulated and then finding out it is impossible (and all this without guidance, I say again) was a recipe for disaster. That is my point, Dino. It is not to create disparity. The disparity already exists. Like you, I don’t like it either. But any such examples do not change the key fact that there’s only one Gospel for all of us. If someone is, as you explain, feeling “burdened and overwhelmed”, and if when reading that “if they are struggling that this is evidence that they do not know God” this discourages them, you must become aware that this happens just as much to monastics, if not more, than it does to laity. One’s suffering “without any reprieve” when assaulted by the thoughts of (as you say) : “well, I must have abandoned God”, “it is all my fault”, “this is like beating a dead horse”, “I can’t do this”, is just as likely, (I would venture to say more likely), in a monastic setting as in a lay one. What makes a difference of course, as you allude to, is having the readily available counsel of a truly consoling and discerning spiritual guide. Both laity and monastics might be fortunate enough to have such a person available, or not so fortunate. Thank you all for your words of wisdom and kind wishes & prayers for my husband & I. All of you have unique & valuable comments and from them I have gleaned a lot of useful information. I will contemplate prayerfully and synthesize everything said. Since I don’t have a spiritual guide, your comments have provided some needed direction in my walk with the Lord. Please indulge me one more time…I think I need to clarify something. In order to make a point, I may have unintentionally implied that I am anti-monastic. In truth I am not. 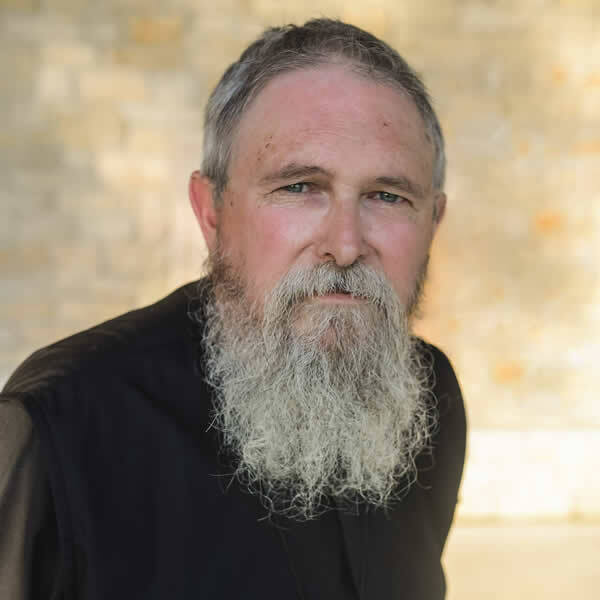 But with many of the faithful here in America I strongly sense a disconnect in understanding monasticism. I think we desire very much to understand, but I think it must be tailored to the uniqueness of life in America. I have been thinking about this upon this conversation coming to a close…. First, I want to express my gratitude to Kouria Frederica (Mathewes-Green) for introducing me to a monastery here in America, the Orthodox Monastery of the Transfiguration. It was founded by a Romanian princess, Princess Ileana, who became their first abbess as Mother Alexandra. Her vision was to build a monastery here in America, where Orthodoxy would resound in the uniqueness of our culture. I recall several years ago when Kouria made a comment on the blog. We all welcomed her. I didn’t know her then…I didn’t know what the word “Kouria” meant either! Anyway, Father Stephen mentioned an important thing…that Kouria and her husband Gregory (a Priest in the OCA) were instrumental in his journey to Orthodoxy. Father mentioned that there is a certain group of people within the OCA who understand the importance of fostering Orthodoxy in America (again, in her uniqueness) so that the American people can easily relate. Father said he continues to stay close to these people. Reading about this monastery, including articles written by the current abbess, Mother Christophora, I had no difficulty whatsoever with their words. I did not sense any harshness…not in the least. It was nothing less than a delight to read and get to know them. I hesitate to compare with those from Mt Athos, or from the other Orthodox countries, because what I say will probably not come out right. But for some reason this harshness does not go over well at all with Americans. It just doesn’t. I only wish I lived closer to that monastery. I sense that they do not have an attitude where they set themselves apart from the greater community. In fact most of the nuns have lived a greater part of their lives in “the world” in America and can sympathize with our struggles. Perhaps I have said enough for now. And thank you Father Stephen. I really see part of this wonderful “tapestry” God is weaving for all of us, as I look back at these “incidences” on the blog, weaved later into contact with Kouria and the monastery. God is good. We really are united in diversity.